I found some awesome frames at the thrift store. I think I may have actually got two of the same frames My Dear Trash used. 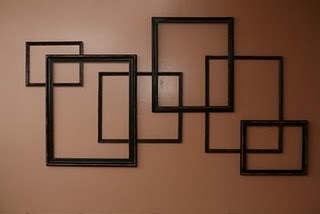 Arrange the frames into any pattern and nail them together. Well, hello there! I found you on the girlcreative. I just love your wall art! Super mod. I hope you have a great weekend. Stop by my blog if you get bored. I'll spice you up a bit...but not too much.